(8 weekly online classes of 90 minutes each, in 2 Modules of 4 classes each). 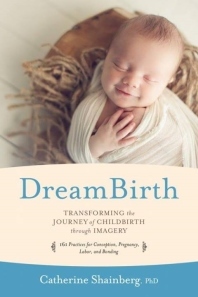 There is no greater tool for both pregnancy and childbirth than DreamBirth® Imagery. Imagery is the language of the body, of experiencing. It is the first language the body understands. As Catherine Shainberg, the creator of DreamBirth® explains: “The body doesn’t understand words as well as it does pictures. You can’t tell your heart to beat less quickly, but by imagery you can learn to quiet heart beats, to lower high blood pressure, to stop premature contractions”, to get the baby in the right position, to open easily, to diffuse and lessen pain—the list is endless. In these two Modules, you will experience and learn the exercises that have transformed many births. We will do the exercises together. They last from one to three minutes, are very easy to learn, and are relaxing and fun to do. Class 2 and Class 3: Relaxation and safety, clearing worries and incorrect ideas, creating optimism. In this Class you will learn to develop flexibility of body and mind, as that is what birth and mothering require. DreamBirth® exercises allow us to direct the cells of our body, nature itself, into its most optimal, easeful functioning. You will learn the importance of alignment for comfort and for an easier birth. We will do exercises that expand and lengthen. and learn to turn a breech or misaligned baby. Light, air and water images expand; you will experience the connection between jaw and pelvis, mouth and cervix. In this Module, you will learn coping strategies for every stage of labor. We will address practical matters such as common hospital routines and show you ways to transform potentially distracting or problematic situations that may be encountered in a hospital setting. We will address as well any remaining emotions that may get in the way; fear, guilt, anger, lack of self-worth. In the final classes we address post- partum concerns including milk production, sleep exhaustion and feelings of overwhelm. And finally, you will learn exercises to repair the body postpartum and to connect with baby long distance. Classes will be taught by Claudia Raiken, who worked with Catherine on the development of the DreamBirth® method, with seven other doulas, nurses, psychologists and birth professionals. Claudia is a Childbirth Educator (ICEA), a Doula (ALACE) , an Alexander Technique Teacher and a Biodynamic CranioSacral Practitioner. She holds a Masters from NYU in Kinesiology and Dance, and is certified by The School of Images® as a DreamBirth® practitioner. "I can unequivocally assert that there is no greater tool for both pregnancy and childbirth than DreamBirth®. It is also an incredible tool for conception: 95% of the women I worked with have conceived. Many of these women came to me in desperation, still unable to conceive after having multiple IVF’s. DreamBirth® is a beautiful adjunct to any other modality that is being used for conception; it will enhance the effects of acupuncture, herbs, and IVF."